A broken wrist (or fractured wrist) is a fracture or break in the wrist end of either the radius and ulna forearm bones or any of the small carpal bones in the wrist. There are a number of different types of wrist fracture so an accurate diagnosis is essential to get the most effective treatment. If you get sudden wrist pain and any of the other following symptoms, you should get medical help as soon as possible. Broken wrist symptoms will vary slightly depending on the type and grade of the fracture. Sudden pain is common with rapid swelling and the wrist may appear deformed. Pain is likely to increase when trying to move the hand. If tingling or numbness are felt anywhere in the hand or fingers this may indicate nerve damage. There are a number of fractures of the wrist. Below we outline some of the more common. If you suspect a broken wrist then medical attention should be sought immediately. An X-ray should be taken to determine the extent of the fracture and displacement of any bone fragments. A full examination of any fractured wrist will help to rule out any other associated injuries. Sometimes the bone fragment may be broken into more than one piece, known as a comminuted fracture of the wrist. If bones pierce the skin then this is known as an open fracture. Below we explain some of the more common types of wrist fracture. A Colles fracture is a break at the wrist end of the radius bone in the forearm. The most common cause of a Colles fracture is a fall onto an outstretched arm, particularly in older females who may be suffering from osteoporosis. Symptoms include sudden pain in the wrist with rapid swelling. There may be deformity known as a dinner fork deformity. The patient will experience severe pain when trying to move the wrist. In very severe cases one end of the bone may pierce the skin which is known as an open fracture. Due to the force which is required to fracture the distal radius (forearm bone), sometimes a fracture of the end of the Ulna (other forearm bone) may also occur. Soft tissue injuries to the ligaments at the wrist especially are also common. The treatment of a Colles fracture depends on the extent of the injury. A straightforward fracture with no displacement will simply require casting to immobilize the bones until they are healed. This is usually around 6 weeks. A splint may be used for the first few days to allow the swelling to go down before the cast is applied. Read more on Colles fracture. A Scaphoid fracture is probably the most common wrist fracture and involves a fracture to one of the small carpal bones in the wrist called the scaphoid bone. The blood supply to the scaphoid is poor so complications and incomplete healing can occur. Symptoms of a scaphoid fracture include pain in the wrist at the time of injury and rapid swelling at the back of the wrist. Pain may settle down soon after the fall but the patient will have difficulty gripping things. There will be tenderness when pressing in on the wrist compared with the noninjured wrist. The exact area of tenderness is called the anatomical snuff box and is located between two tendons on the thumb side of the wrist. Compression of the thumb inwards towards the wrist causes pain. Initially, treatment of a scaphoid bone fracture would be to apply ice or cold therapy, protect the wrist with bandaging or strapping and seek medical attention. Scaphoid fractures have a risk of not healing properly due to the poor blood supply. If this happens then in some cases the fracture is immobilized again for a further 4 to 6 weeks. Immobilizing beyond this time is unlikely to be beneficial so in this case, surgery is often required and many surgeons would do this sooner rather than opt for a further period of immobilization. Read more on scaphoid fractures. Another type of wrist fracture is a fractured hook of hamate. 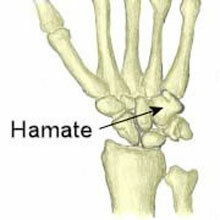 This is a fracture of the hamate bone which is one of the small carpal bones on the little finger side of the wrist. It has a hook-shaped part which protrudes outwards and can under certain circumstances be fractured. Symptoms of a fracture of the hook of hamate include wrist pain which is located on the little finger side of the wrist. The patient will have reduced grip strength and there will be tenderness when touching the palm side of the wrist. A fracture of this part of the hamate bone in the wrist can occur from swinging a golf club, tennis racket or baseball bat, particularly if it suddenly hits an immovable object, for example, a golf club hitting the floor. A stress fracture can also occur and if it goes unnoticed it can progress and turn into a full fracture. Treatment usually involves immobilization in a plaster cast for 4 weeks. If the injury is noticed late then it is likely not to heal in which case the most popular option is to remove the fragment of bone completely followed by immobilization in a cast for 3 weeks. Return to sports specific training may take 6 weeks or more. When the wrist comes out of the cast mobility and strengthening exercises should be done to restore full movement. Putty exercises and using hand exercise balls are excellent for achieving this. A Triquetral Fracture is a break of the Triquetral bone (sometimes called triquetrum) is one of the eight small carpal bones in the wrist. 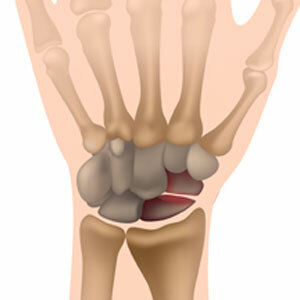 The Triquetral is the second most commonly fractured carpal, behind the Scaphoid. A sudden, direct impact is the most common cause of this fracture, which causes wrist pain on the side of the little finger. This fracture can also often occur alongside other wrist injuries. Symptoms include pain in the wrist after impact, trauma or falling onto an outstretched hand. Pain will be located on the little or pinky finger side of the wrist. There will be rapid swelling and tenderness when pressing in over the site of the fracture. Reduced grip strength and range of motion are common. Triquetral fractures most commonly occur after a fall onto an outstretched hand, especially with the wrist in extension and ulna deviation (bent back and tilted, little finger side downwards). A direct impact from a blunt, hard object on the back of the wrist could also cause this injury. Triquetral fractures may occur in isolation, with no other associated injuries. However, they are often more complicated and may include other fractures, such as to the lunate, as well as fracture dislocations and soft tissue injuries. If a fracture is suspected, seek medical attention as soon as possible. An X-ray will be required to confirm the diagnosis and rule out any associated injuries. Isolated Triquetral fractures tend to heal well with immobilization. The wrist is placed in a cast for approximately 6 weeks so the bone can heal. After this period, the cast is removed and exercises to regain full movement and strength at the wrist should be performed. A Bennett fracture is an injury to the base of the thumb joint, which is usually caused by a hard impact or trauma such as punching something hard or falling onto the hand with the thumb sticking out to the side. A Rolando Fracture is also a fracture to the base of the 1st metacarpal where it joins the carpal bones between the thumb and the wrist, although a little more complex to treat as the metacarpal is fractured into several pieces. Symptoms will be similar to other wrist and hand fractures with immediate and severe pain over the thumb side of the wrist. There will be rapid swelling and bruising may develop. The patient will find it very difficult to move the wrist and thumb experiencing a lot of pain. In more serious cases the thumb may appear deformed. 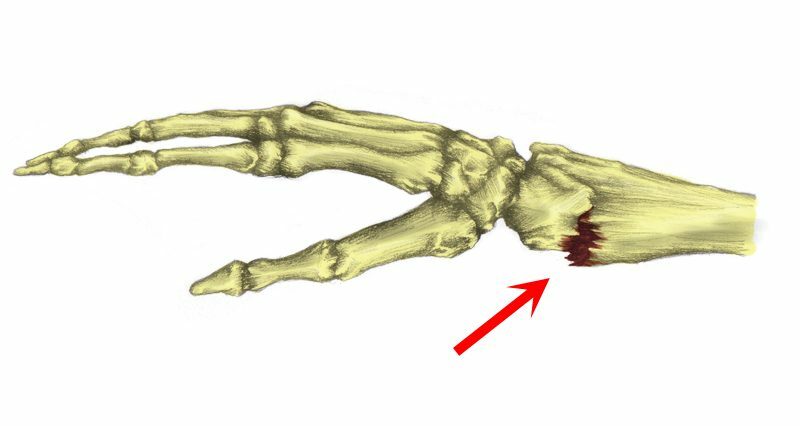 It is a fracture and dislocation of the joint at the base of the thumb where the carpal bone meets the metacarpal bone ( known as the first carpometacarpal joint). A small part of the metacarpal bone will remain attached to the volar ligament while the main part of the bone is dislocated. It is similar to a Rolando fracture which is also a fracture to the base of the thumb but with more serious fragmenting of bones. A Bennett fracture is a serious injury which if not treated correctly can cause permanent disability. In particular, problems, when bringing the thumb across the palm of the hand and pinching with the index or middle fingers are common if the fracture does not heal properly. A Rolando Fracture is a fracture to the base of the 1st metacarpal where it joins the carpal bones between the thumb and the wrist. This is similar to the Bennett fracture, although a little more complex to treat as the metacarpal is fractured into several pieces. This causes considerable thumb and wrist pain, with surgery nearly always needed. 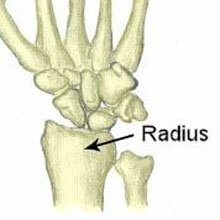 A Rolando fracture will most likely be caused by a sudden impact or trauma such as punching something hard. The patient will feel immediate severe pain on the thumb side of the wrist. There will be rapid swelling and bruising may appear. The thumb may appear deformed depending on the level of bone displacement and the patient will experience great difficulty and a high level of pain when trying to move the thumb. The difference between a Rolando fracture and a Bennett fracture is that with a Rolando fracture the base of the metacarpal is fractured into 2 or 3 fragments (occasionally more). This is known as a T or Y shaped fracture due to its appearance. Surgery is almost always required. It is essential the all the bone fragments are put back in place and pinned or screwed if needed. The procedure involves realigning the bone fragments and then fixing them with either internal wires or pins, or an external frame and pins. The joint is then immobilized in a thumb spica cast (where the thumb is kept separate from the hand) for 4 to 6 weeks. When the cast is removed, the patient is referred to a physiotherapist, physical therapist or similar who will help mobilize the joint as well as giving some home exercises for strength and mobility. When getting back to the sport, the use of a protective thumb splint or support is recommended. 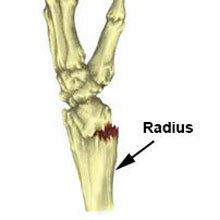 A Smith’s fracture is a break at the end of the radius bone, at the wrist and is often caused by a sudden impact. The fragment of fractured bone is displaced forwards to the palm side of the wrist, which causes swelling and pain to the area. You should try not to move the injured wrist afterwards, and medical help is needed as soon as possible to treat the fracture. Symptoms of a Smith’s fracture include sudden pain in the wrist after a fall or impact. There will be tenderness in the area of the fracture with pain and difficulty moving the wrist. The wrist may appear deformed with the hand appearing to be angled downwards. There will be immediate swelling and bruising may develop. A Smith’s fracture is a break at the end of the radius bone near the hand or distal end as it is known. It is similar to the more common Colles fracture except that a Smith’s fracture occurs for an impact or trauma with the wrists flexed or bent with the palms down. It is named after the Surgeon Robert William Smith who lived between 1807 and 1873 and named it in his book published in 1847. If a fracture is suspected, seek medical attention. Don’t try to move the wrist, just immobilize it in a sling. An X-ray is required to confirm the fracture. In some cases, it may be possible to reduce the radial fragment (move it back into position) manually, without the need for surgery. The arm is then immobilized in a cast for around 6 weeks whilst the bones heal. In the majority of cases, surgery is required to realign the fragment with the rest of the radius. The bones are then pinned in place and the arm cast whilst it heals as above. After the cast is removed, a rehabilitation program is required to regain full wrist mobility and strength.